St. Martin's Press, 9781250072634, 304pp. 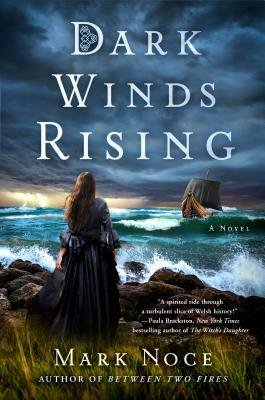 Mark Noce returns to Medieval Wales with Dark Winds Rising, his second book about the Braveheart-like Queen Branwen in this epic historical series. Three years after uniting the Welsh to defeat the Saxons and settling down with her true love, Artagan, Queen Branwen finds her world once again turned upside down as Pictish raiders harry the shores of her kingdom. Rallying her people once more, she must face her most dangerous foe yet, the Queen of the Picts. Ruthless and cunning, the Pictish Queen turns the Welsh against each other in a bloody civil war. All the while Branwen is heavy with child, and finds her young son’s footsteps dogged by a mysterious assassin who eerily resembles her dead first husband, the Hammer King. In the murky world of courtly intrigue, Queen Branwen must continually discern friend from foe at her own peril in the ever-shifting alliances of the independent Welsh kingdoms. Branwen must somehow defeat the Picts and save her people before the Pictish Queen and the assassin destroy their lives from the inside out. Just as the Saxons threatened Branwen’s kingdom from the landward side of her realm in Between Two Fires, now the Picts threaten her domain from sea in this thrilling sequel. But she soon finds that the enigmatic Picts are unlike any foe she has faced before. Mark Noce bases his novel on primary sources, as well as myths and legends that help bring the Dark Ages to life. Set in a time and era in which very little reliable written records or archeological remains have survived, the characters and some of the place names are fictional, but the physical environment, the historical details, and the saga of the Welsh people is very real. This continuation of Branwen's story combines elements of mystery and romance with Noce's gift for storytelling. MARK NOCE writes historical fiction with a passion. Born and raised in the San Francisco Bay Area, he has been an avid traveler and backpacker. He earned his BA and MA from Cal Poly, San Luis Obispo, where he also met his beautiful wife. By day, he works as a Technical Writer, having spent much of his career at places like Google and Facebook. He also writes short fiction online. When not reading or writing, he's probably listening to U2, sailing his dad's boat, or gardening with his family.